Nice lighting in this one, Steve. I wish we had cacti growing along our street. I am about to remove all of mine from my greenhouse window and into the great outdoors for another summer. I like the way the bright yellow of the flower echoed onto one side of the bud. 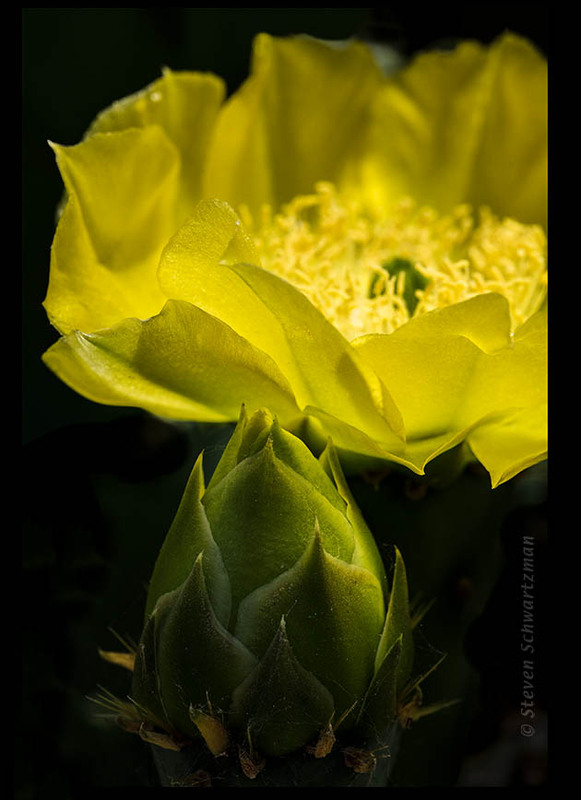 I’m still not sure I like having cut off the right side of the flower, but I’ve done plenty of convention portraits of a prickly pear flower and felt like trying something different. A happy summer release to your greenhouse cacti. The black surrounding the flower gives the image a foreboding feeling, to me. As if to suggest the thorns that accompany the bloom. I like the crop. Is this early for them to be in bloom? Instead of adding my usual 2-pixel black border I added a much thicker black border. I felt I needed to do that on the right especially, to balance the blackness to the left of the flower. I can see how all the black, original and added, would give you a sense of foreboding. April is the normal time for the prickly pears here to flower. In the few days that we’ve been back from our mini-trip I haven’t seen any more of these flowers, so the bloom period may already be over. On the other hand, I haven’t gone out looking, so there could still be some prickly pear flowers. Spring was advancing almost too quickly here with blooms coming weeks early and lasting only days, but cool weather and rain have arrived to put on the brakes. Good. We wouldn’t want the spring to get away from you too soon. It’s interesting that in Kerrville and the surrounding area last week, there were plenty of prickly pear buds, but few blooms. I found orange buds, too, but no open flowers. Austin may be ahead of that area, of course, but it surprised me that the prickly pear seemed to be later this year. The greenish-yellow is a nice change, and I think it helps to make the bud the central focus. In turn, that makes the bloom feel not at all truncated. It’s simply there as a lovely complement to the bud. I suppose because of the color, the bud reminds me of an artichoke. Convergent evolution strikes again. Although cacti are in a different botanical family from artichokes (which are in the sunflower family), both exhibit Fibonacci growth patterns. My impression is that Kerrville, though at about the same latitude as Austin, is in a region that’s colder (and of course colder than the coast as well), so bloom periods there often start and end later than here. In addition, I’ve seen how much things can vary in a given place from one year to the next. Have the prickly pears finished flowering near the coast? It’s interesting that you don’t feel that the flower is truncated. That makes me think the picture succeeds in spite of the unusual framing. Actually, I haven’t seen a big prickly pear bloom yet this year. There are occasional flowers here or there, but I went down to our local large stand after reading your comment this morning, and there are only buds. I’m hoping to get out and about tomorrow for a bit. Now I’m curious to see how others are coming along. It’s strange that Austin had prickly pear flowers weeks ago while you haven’t yet seen many a few hours to the west or east of here. Well, with the legislature in session, all that hot air could have raised the ambient air temperature in your neighborhood. Now why didn’t I think of that explanation? We can call it political warming. I’m fond of edge-on pictures of things. The week before last we headed north, expecting to get as far as South Dakota. Unfortunately the weather forecasts for up there, which we kept checking along the way, continued mentioning cold weather, overcast skies, wind, rain, and even a little snow. In the end we played it safe and turned back after Kansas City. You’re not alone in looking for warmth and light. Hope you have found some by now. We have. Austin is plenty warm. While this morning is overcast (it’s 7 AM here now), the past three days were beautifully sunny, so I went out photographing on the first two of them. I’m sorry that you’re heading toward winter. You know me, Julie, always fooling around with the light. For as long as I can remember, I’ve been fond of yellow.